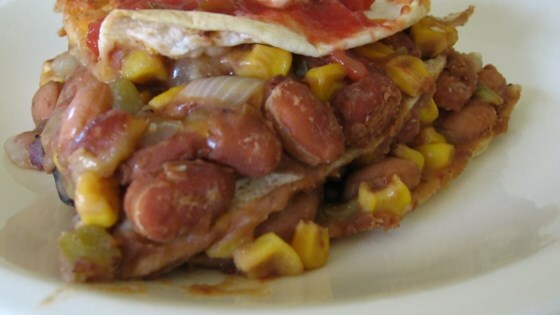 "A quick easy tortilla pie filled with a spicy bean and veggie filling. You can replace the Cheddar cheese with Monterey Jack or any other cheese you like. Top the pie with sour cream and your favorite salsa. Add extra fiber to your diet by using whole wheat tortillas!" Preheat oven to 350 degrees F (175 degrees C). Lightly grease a 10 inch round cake pan or springform pan. In a large saucepan over medium-high heat, mix black beans, pinto beans, refried beans, olives, corn, bell pepper, and jalapeno pepper. Season with cumin, chili power, and black pepper. Cook and stir until thickened, about 10 minutes. Lay one tortilla flat on the bottom of the prepared baking pan. Spread 1/4 of the bean mixture on the tortilla. Sprinkle 1/4 cup Cheddar cheese lightly over the bean mixture. Repeat layering, ending with a tortilla. Top with remaining Cheddar cheese. Bake 20 minutes in the preheated oven. Allow to cool slightly before serving. Serve with salsa and sour cream for garnish. This had no taste whatsoever and was just plain bland. Won't be making this one again. I get 8 inch tortillas and then bake in an 8 inch cake pan. Works out great!